This past weekend was simply crazy. You know scoring was not going as expected when 2 of the top-5 scoring quarterbacks for the week included Christian Ponder and Jake Locker. All across the board there were several studs who put up dud numbers, while the typical pedestrian players bursted out for big days. It happens. It’s football. That’s also what makes this game so fun. It’s unpredictable. Regardless, those of us who write about fantasy sports try our darndest to make it as predictable as possible. It is a business of trying to predict the future. We’re going to be wrong. We’re going to miss calls…a lot. We just go off of what we have and try to minimize risk while maximizing return. Let’s a look at players whose value has risen or fallen after 3 weeks of play. Barring injury, which is always a concern with Mathews, this could very well be the lowest his value will be the rest of the season. Is it even possible to “buy low” on a player that was the first pick of the draft for many fake managers out there? After the past couple weeks he’s had it could be. Over the last two weeks Mr. Rodgers has a total of 442 yards and 1 touchdown. Last year that would have been disappointing for a single week, not to mention two weeks worth of numbers. After Monday night’s debacle of an ending, referencing the wins and losses are a bit misleading. Even still, his first three opponents this year have been a bit of a murderers row of defenses to start the year against. Rodgers has had to start the year against San Francisco, Chicago, and Seattle. All three are quite possibly top 5 defenses this year. If not the top 3 by themselves. Next he does get that juicy matchup against New Orleans. So expectations on that game alone could make any perceived discount null and void. It’s worth it to shoot some offers out there and see if any bite. Watch him closely this week and if he doesn’t light up the scoreboard against the Saints then could possibly be had for a bargain. The past two weeks have been rather disappointing for Marshall owners. After a very nice Week 1 against Indy, he has a combined 7 catches for 95 yards from over the last two games. The next week might not get much better when he goes up against the renewed Dallas secondary. Even with this taken into consideration, he could be had for nice value. Take advantage of this because Cutler is still looking Marshall’s way a lot. He is getting tons of targets. This is why I still believe in him. It will help him a lot if Forte comes back fully healthy, and if Alshon Jeffery (or any other Chicago receiver) would step up more consistently to take defensive pressure away from Marshall. After three weeks, he’s obviously second fiddle in the fast-paced Atlanta offense. The thing is, the guy is still getting plenty of looks. His catch totals over the past three weeks have been 6, 8, and 5 with only 1 score. I believe that several more scores are to come, especially considering his nice matchups coming in the next few weeks. See if your Roddy White owner is getting disinterested and shoot an offer. Better days are yet to come. It’s actually a surprise to many of us in the fantasy community that Turner “The Former Burner” even has much value at all. He just looks slow. As someone on Twitter said, “He looks like a pug rolling uphill.” He’s scored two weeks in a row, and in Week 3, he posted his highest yardage total. Though he may not have a ton of value right now, start sending offers out to any running back starved owners, and the name may make them bite. Sell him for something while you can. In his first game action of his career, Leshoure ran for 100 yards with a score on 26 carries. Detroit sees him as a workhorse. He is the most talented running back they have, for sure. The future for this guy is sunny skies and rainbows. This is why I would sell high on him. He has a bit of an injury history. This was his only game of his career. He has some tough defensive matchups ahead, too. Get as much out of him as you can. And just like I said for CJ Spiller last week, he could very well be a solid fantasy contributor for the rest of the season. But I say sell high. Not because I think he’ll tank, but I personally think we saw his approximate ceiling in a pass-happy offense. It inspired me to include him in this article when I received a trade offer for him asking for Brandon Marshall… and my first reaction was to scan my wide receiver depth and seriously think about it. Do the same. Put his name out there and see what consistent veteran you can get in return. He has had a couple of impressive showings over the first three weeks of the season. He is currently the 7th overall receiver with ESPN standard scoring. Brees had been targeting him quite a bit, but with Colston coming back, try and see what you can get in return for Moore. Look for an owner very thin at receiver (probably an early-round quarterbacker) in your league. He’s typically been a frustrating player to own because his production is such a roller-coaster, but another owner could believe more in Moore. I had trouble finding quarterbacks to sell high on. I did mention Robert Griffin III last week, but with each week I see him play, the more I believe in him. He is becoming “the next Cam Newton” that many drafted him to be. All the while, Cam Newton himself is disappointing owners. Matt Ryan is right there with RG3 atop the QB rankings, and I don’t see him slowing down. He has a great schedule ahead that still includes two games against the Saints and two games against the Buccaneers. Turner is no longer a “burner”, and young Julio Jones is turning into the monster wideout we expected. They are utilizing the personnel to the best of their ability in the new up-tempo offense. 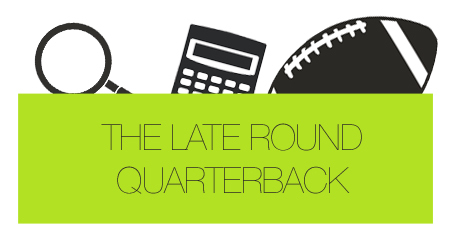 Looking at what is going on with quarterbacks so far is a testament to the late-round quarterback strategy. Many of the quartebacks drafted in the late-rounds (some not even drafted) are showing themselves to be very consistent fantasy contributors. While the big name passers are leaving their owners disappointed. If you haven’t already, go get JJ’s book. It’s not just a book about drafting a quarterback late. It talks about season-long strategies. Oh, and follow me on Twitter, too (@Ladd_Davies).